On May 15th, 2015, producer-director (and USC class of 1986 alumnus) Jay Roach delivered the commencement address at the USC School of Cinematic Arts graduation at the Shrine Auditorium in Los Angeles. Roach presented screenwriter and producer Melissa Rosenberg with the Mary Pickford Foundation Alumni Award. 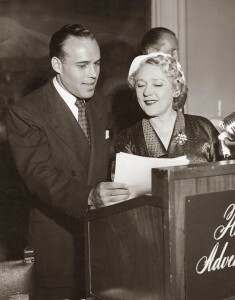 The Mary Pickford Foundation wishes to acknowledge the passing of Mary Pickford’s friend and former business partner Malcolm Boyd. P.R.B. (which stood for Pickford-Rogers-Boyd) was the name of their radio and television production company. Read more about Boyd’s life and legacy here. On November 3rd, the third Annual Mary Pickford Celebration of Silent Film, presented by the Academy of Motion Picture Arts and Sciences in partnership with the Mary Pickford Foundation, will host the world premiere of the Academy Film Archive’s restoration of Little Annie Rooney (1925) from Mary Pickford’s own 35mm nitrate print held in the Mary Pickford Collection at the Library of Congress. Mary Pickford’s Sparrows (1926) will be screened on Saturday, October 11th at 2:30 p.m. at the Bruno Walter Auditorium inside the New York Public Library for Performing Arts in New York City. The Sparrows matinee, utilizing a restored 35mm print from the Library of Congress, is part of “The Silent Clowns” film series and will be introduced by Jeffrey Vance, with piano accompaniment by Ben Model. Click here for tickets and details. On September 16th, silent film accompanist Ben Model will be performing a score for The Hoodlum, a Mary Pickford comedy from 1919, at the Cinema Arts Centre in Huntington, New York. Don’t miss your chance to see Pickford in a role that Variety claimed “will send them away delighted and happy,” with live music by one of the leading silent film accompanists in the industry. Visit the Cinema Arts Centre website for tickets and details. The Mary Pickford Foundation is pleased to announce the West Coast debut of Their First Misunderstanding, the 1911 Mary Pickford short film discovered in a New Hampshire barn and restored by the Library of Congress in 2013, at the 50th Annual Cinecon Classic Film Festival. On Saturday April 12th, the Mary Pickford Foundation and Pepperdine University present the world premiere of three original music scores for Mary Pickford films. Student composers Matthew Aune, Andy Gladbach and Thomas B. Yee have scored the 1912 Biographs A Lodging for the Night, The School Teacher and the Waif, and So Near, Yet So Far. The films will be screened in the Pepperdine Amphitheater with accompaniment by the Pickford Ensemble under the direction of N. Lincoln Hanks. Admission is free. For more details, visit the Pepperdine Fine Arts Division site. “There was never a sweeter cricket than Fanchon … and there was never a Fanchon like Mary Pickford,” said The Moving Picture World upon Fanchon the Cricket‘s 1915 release. Adapted by Frances Marion from a George Sand novel, the film was believed to be lost for decades. In the 1990s three of five reels were discovered in England, and now the Mary Pickford Foundation is pleased to announce a screening of the complete feature at Cinefest 2014 in Syracuse, N.Y.
On Wednesday, March 5th, the Mary Pickford Foundation and the Hollywood Heritage Museum present an Evening at the Barn with early Mary Pickford rarities. Wildly popular upon its 1915 release, Rags is one of the oldest surviving Pickford blockbusters. In the film, Mary plays both a spirited waif and her mother alongside Mary’s future director Marshall Neilan. Preceding the feature will be the 1912 Biograph short A Lodging for the Night, accompanied by Andrew Manley. The show begins at 7:30 pm at the Barn on Highland. To reserve a seat, visit Brown Paper Tickets. Their First Misunderstanding (1911) was Mary Pickford’s first short for Carl Laemmle’s IMP studio after she left the Biograph Company in late 1910. (Read more about Mary’s IMP experience here and here.) Long considered a “lost” film, this treasure was discovered in a New Hampshire barn and recently donated to Keene State College, which worked with the Library of Congress to restore the film. Exciting news for all Cinephiles and silent fans: on this Labor Day weekend the Mary Pickford Foundation will join the annual Cinecon Classic Film Festival in Hollywood for a special screening of two Mary Pickford films, The Pride of the Clan and The School Teacher and the Waif. The Pride of the Clan has not been shown in Los Angeles in over 20 years, and this rare Biograph short has not been on the big screen in decades. Mary Pickford Foundation now has an official Facebook page.’Like’ us to keep track of news, events, screenings and more.